It's that time again - the fourth Thursday of the month, where a group of creative bloggers come together to share their lovely transformations of a thrift store item. Who doesn't love thrift store upcycle projects - whether it's actually creating one or admiring how an item from a thrift store was transformed! Begin by washing out the soda cans to remove any sticky residue and let dry. Using a craft or x-acto knife, make a slice near the edge of the can big enough for a scissor blade. 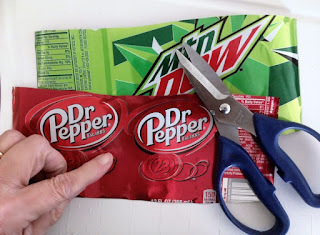 Using craft or old scissors, cut around top and bottom to remove. Then cut through the length of can to open and finish sides by cutting off any slivers or jagged edges. Roll the aluminum in the opposite direction to help remove the curl of the can while smoothing and flattening it out. *CAUTION: Be very careful handling the sharp edges of cut cans. Next, insert the aluminum can strips into flower punchers to punch-out two different sizes, one large and one small to make lots of flowers! Next, paint flower petals with white multi-surface acrylic paint first to cover lettering, etc., and let dry. Then, paint with different floral colors and let dry, again. Apply gloss varnish to seal colors. The petals will take on a different feel and texture, almost like leather, by painting them! Once dry, roll the flower petal edges with a pen, pencil or stick for a dimensional look. To assemble, layer a larger shaped petal with a smaller one, gluing together with Loctite super glue gel. Then glue-on a silver bead to the center of flower. And finally, glue flowers onto basket in a colorful, decorative manner. How cool does this look! Just perfect for Easter, spring, or summer! The tutorial for the paper mache bunny can be found here. And now for more thrifty goodness! Check out what my fellow upcyclers created below! Thanks for stopping by! That really dressed up the basket! And how cute does your bunny look next to it? Perfect! What a great use for soda cans. I can see you have to be careful. Looks so cute along with your bunny. How creative Gail! I would never have thought about using soda cans to glam up that little basket but it really does the trick. And the colors are beautiful! Oh my, those are so pretty! I'd love to learn how to make them and practice a bit. They really look good on your metal basket, which is a great way to display them. Son unas flores bellísimas Gail ,te felicito por el reciclaje !!!!!!! This is so fantastic. What a difference those flowers make. When I saw this come up in my feed I knew it was yours! It has your signature look. Beautiful flowers! Wow! Those flowers are so pretty. I have made some stars from pepsi and coke cans and added the lights but I love the idea of painting them to match anything. They really took the basket to a new level! Nice job. Oh wow....that is so adorable. Great job with the soda cans! Awww Gail, I always get this heart smile when I see one of your posts. Love what you did with this thrift store basket thingy. Those soda pop flowers just make it so much more. Hello! Lovely job on this project. I didn't know you could use hole punches on a can! Did it dull it for cutting paper after this project?